To skip to Action Step 4, click here. 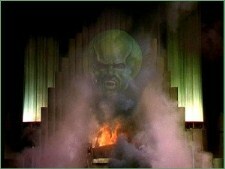 As children, most of us remember seeing and having the bejesus scared out of us by the movie, The Wizard of Oz. Poor cute little ole Dorothy, lost in a strange world of good and evil, who accidentally became the target of the purely evil, wicked Witch of the West. 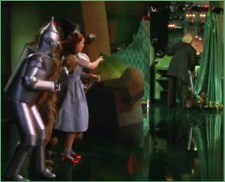 Only one person could save her: the all-powerful Wizard of Oz. It must be true – and worth the dangerous trek to see him. Everyone in the fantasy land of Oz agreed. The Wizard could – and would – save her! The Wizard’s power was all an illusion. Behind the curtain was a little man, caught red-handed manipulating the mirage. Alone and exposed, he was meek and quivering, a mere shell of the powerful persona he had created and sold to the entire populace. RTC was not intended to be the all-powerful entity it has evolved into, with a singular, “Chairman of the Board,” pope-like ruler over the entirety of Scientology. The authority of David Miscavige is all an illusion. LRH intended one-man rule to end upon his death, to be replaced by multiple cross checks and balances in three separate corporations ruled by seven boards of trustees and directors. RTC is organized pursuant to California Nonprofit Religious Corporation Law, and thereby is subject to that law, which is set forth California Corporation Code, beginning at section 9110. 1.The filing of Articles of Incorporation setting forth the name and general purpose of the corporation. Section 9120. To view RTC’s articles, click here. 2.Bylaws must be adopted to regulate and manage the affairs of the corporation. Section 9140. To view RTC bylaws, click here. 3.The corporation must abide by: a) its Articles; b) its Bylaws; and c) Corporate law. Section 9140. 4.Each corporation must have and be managed by a board of directors. Section 9150. 5.The board of directors may delegate but is ultimately responsible for all affairs and activities of the corporation. Section 9150. 6.A board of directors shall have a chair (head of the board). Section 9123. 7.Each director shall have one vote and a majority vote is required on each act of the board. Directors may not vote by proxy (i.e., give up their vote to another). Section 9211. The RTC bylaws created and approved by LRH call for two boards: (1) a board of trustees and (2) a board of directors. The initial trustees, who were selected or approved by LRH, were appointed for life. Section 1. Purpose. The sole purpose of the Board of Trustees shall be to elect Directors of the corporation. In furtherance of this purpose the Trustees may remove a Director who fails to meet the qualification of a Director or who conducts himself in a manner which is contrary to the provisions of Articles I through IV of these Bylaws and the survival of Scientology. The trustees are supposed to meet annually. i. Election or removal of Directors. The RTC board of general directors is charged with overseeing the activities and affairs of RTC. There are 3 general directors, one of which is the chairman of the board. ●May not be elected from among the trustees. This means that the RTC trustees, who were approved by LRH and appointed for life, are senior to the chairman of the board of RTC (COB RTC). Obviously, the RTC Trustees can only exercise this LRH-given power if they are truly independent of, and not subject to removal or dominance by, the chairman of the board. Based on the foregoing, it is clear that LRH’s vision for the governance of RTC depends completely upon the independence of its boards, particularly its board of trustees. As we set forth on this website, our investigation found substantial evidence that the boards of trustees and general directors of CST, as well as the boards of trustees of CSI and RTC, are “sham boards,” completely dominated by David Miscavige. See, Existing Scene. ●Miscavige – not CSI, as LRH directed – administers justice over RTC trustees. None of the members we interviewed had even read the corporate bylaws or state law and IRS requirements for tax-exempt status, let alone understood them. They had never been trained for their positions. Trustees, who were selected by LRH, did not even know their positions were for life. OSA Int, by the way, is in Department 20, Division 7, of CSI. According to the claims of former high-ranking RTC and OSA executives, Miscavige micro-manages OSA Int. So, we have in effect, if true, Miscavige controlling the RTC boards of trustees. In other words, the boards are “sham” boards, mere “rubber stamps” of David Miscavige. And thus, if true, the safeguard established in RTC trustees by LRH has been nullified. The power to remove and elect general directors – including the chairman of the board – has been usurped by Miscavige in betrayal of LRH’s last wishes for the governance of Scientology. The CST special directors – and other lawyers who owe fiduciary duties to Scientology corporations – facilitated this massive betrayal of LRH. They can help to restore LRH Intent or be held accountable. Please help to remind them of their legal duties. Let them know that you know. Let them know that you care and intend to backup LRH. 1)Read the Demand for Compliance Audit letter to CST Special Directors. 2)Send a letter of support to a law firm retained by us, stating your support for the Compliance Audit. IN SUPPORT OF THIS & ALL PRIOR ACTION STEPS. 3)Spread the word. Inform other Scientologists you know of the situation by disseminating one-page flyers to them by: A) email, B) regular mail, or by C) simply stuffing the flyers on their windshields or in their mail boxes. The flyers are intended to alert other Scientologists to the situation we are addressing. See “Instructions” below to download the flyer. 5. Stay tuned for Action Series 5. This entry was posted in Uncategorized and tagged chairman of the board of RTC, church of scientology, COB RTC, CST special directors, David Miscavige, dm, Independence of RTC (Trustees), L. Ron Hubbard, LRH, Religious Technology Center, rtc, RTC trustees, Scientology. Bookmark the permalink. Hey, nice job on this latest article! First I’d just like to say that you’re all performing a valuable service here. That said however there is one point I’d like to clear up here and that is that there never was one man rule over the Scientology Network. From the beginning the Churches have always had Boards of Directors or Trustees. True Ron was the original ED WW but he resigned from this post in 1966 and turned all control of the organization over to the Board of Directors of the Church of Scientology of California and assumed the title of “Founder”. This by the way means founder of the subject *not* the organization. Something he emphasized in RJ 38. The original founder of the organization itself was J Burton Farber a Scientologist who filed the incorporation papers in the State of California in 1954. RTC was never established by him either according to the above RJ. The only reason that Ron agreed to assign the Trademarks to this entity was because they convinced him that they would “preserve and maintain the integrity” of the subject. Also just in case CST fails to live up to its obligation to wrest the subject from those who would pervert and undermine the subject for their own ends. Many who support Miscavige as Scientology’s “pope” or “leader”. There is also the option of demanding that HCOPL 15 Nov 58 THE SUBSTANCE AND FIRST DUTY OF HCO be fully enforced. RJ, thanks for visiting our site and the validation. The point you attempt to clarify, however, is incorrect. As we know today having a board of directors is one thing; having an independent board is another. The boards during LRH’s life were not independent and anyone on command channels can confirm LRH’s leadership role. Not sure of your information about RTC but your conclusions are certainly incorrect. LRH oversaw the corporate sort-out (including creation of RTC) concurrent with his estate plan through attorneys and a mission headed by DM. If is possibile link Lareception.wordpress.com on this website for the italian readers is apreciate . My italian indie blog is without confidential data .